Hi! Rubeena here with a card for you featuring Simple Florals and Thanks a Bunch. I took one of the larger flowers and with some masking, stamped four times using different dye inks on size A2 white cardstock. Then, I stamped some leaves around it. The outline stamps for the flowers and leaves were inked with VersaMark and heat embossed in gold. I die cut pretty borders on two sides. 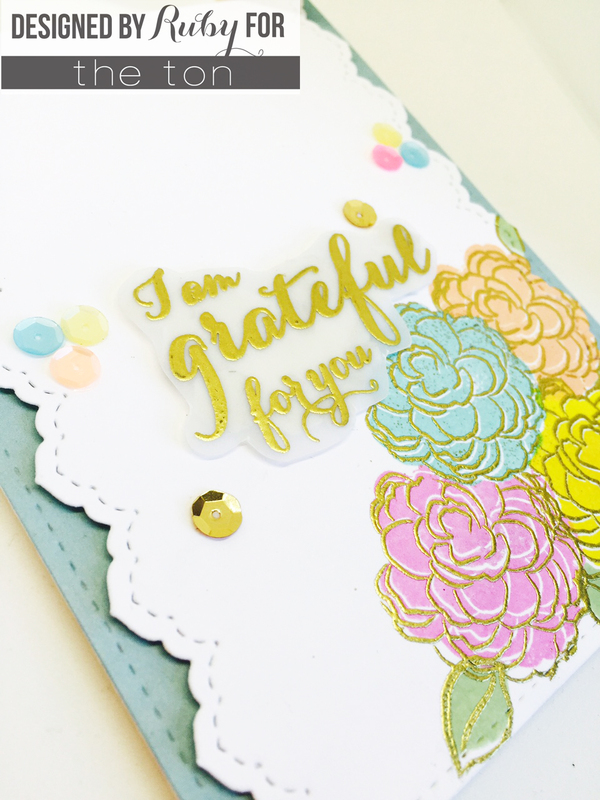 Using different stamps from Thanks a Bunch, I formed the sentiment “I am grateful for you” and stamped it in VersaMark and heat embossed in gold on vellum. I fussy cut around it and added foam tape to give it dimension over the flowers. I added an assortment of sequins in matching colors around the sentiment. I added the finished white piece over a size A2 light blue pattern paper and glued that onto the card base. Thanks for stopping by and leaving love! I appreciate the support as always. Oh how pretty! I love the colors! And the sequins look perfect! This card is so pretty! I love the colors and the lacy edges. Rubeena, you make every card look so amazing!! Love all the details in this..beautiful card! So beautiful Ruby. Love the lace border and how you did your flowers.